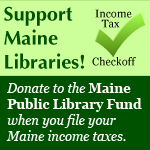 Vassalboro Public Library : No More Eclipse Glasses! I apologize for any inconvenience in advance, but I just received a message that all of the eclipse glasses were handed out. We do not have any more glasses. Thank you.